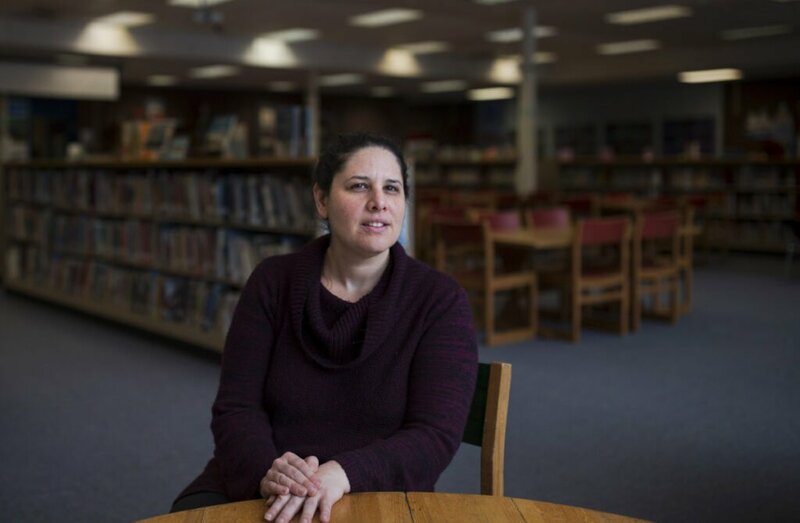 Low unemployment combined with more enticing pay in neighboring school districts creates a staffing shortage, prompting Portland to hike its rates for the first time in six years. The Portland School District is raising the pay for substitute teachers, responding to a staffing shortage fueled by low unemployment rates, competition from nearby districts that paid more and the state’s rising minimum wage. 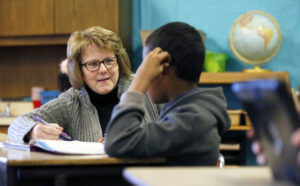 Substitute teacher Cindi Blackie goes over a workbook with a fourth-grader at Riverton Elementary School. Even after increasing pay rates for substitutes, Portland lags several nearby districts. The need for more substitute teachers comes amid a broader shortage in Maine of various school employees including language teachers, bus drivers and special education therapists. The board approved increasing the day rate for substitutes from $70 to $85 for someone with a two-year degree, and from $85 to $95 for someone with a 4-year degree. With a 6.5-hour workday, the new pay rates work out to about $13 an hour for people with two-year degrees and $14.50 for people with four-year degrees. Rates are unchanged for substitutes with teaching credentials, at $100 a day, and for long-term substitutes, who are expected to do lesson planning and other duties, at $214 a day. Even at the higher rate, Portland’s rates are lower than several nearby towns. That matters because substitute teachers can use an online tool to review openings in multiple districts and pick the ones they want to fill. Regional rates for a substitute with a two-year degree range from $75 in Scarborough to $90 in Cape Elizabeth and Lewiston. 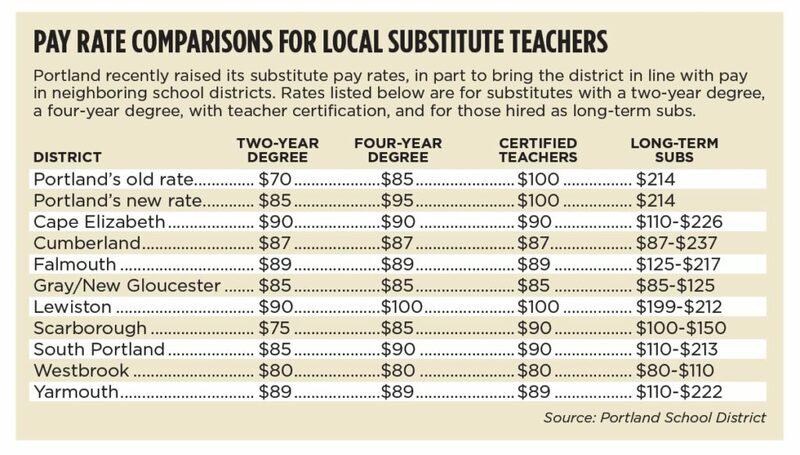 For a substitute with a bachelor’s degree, rates range from $85 in Gray/New Gloucester, Westbrook and Scarborough to $100 in Lewiston. Portland hadn’t changed its rates in six years, according to Barbara Stoddard, the district’s executive director of human resources. “Recently the districts around us have been raising their substitute pay rates, and so we’re finding we’re not quite with the market any more,” she said. The district, which employs more than 700 teachers and more than 200 education technicians, generally needs 50 to 80 substitute teachers a day, depending on various factors. Substitutes are needed when teachers have professional development work or planned days off, as well as for illness and other unexpected reasons. Portland’s demand for substitute teachers is lower than the national average, Stoddard said. Alex Belliveau, who just started working as a substitute at Longfellow Elementary School, said he loves the work and is grateful for the additional pay bump. “I was pretty pumped about that when I got the email,” said Belliveau, 27, who also works at the city’s before- and after-care program at the school. Before enacting the new pay rates this month, the district found substitutes for only about 77 percent of the vacancies, Stoddard said, leaving a persistent gap. When a substitute teacher can’t be found, building leaders make decisions to fill the gap. Sometimes a teacher doubles up two classes, or an ed tech assigned to a library is pulled in to act as a classroom substitute, she said. But the continual shortage is hard for students and teachers. “On a continuous basis, when you are pulling ed techs to sub for teachers or combining classrooms, or trying to figure out how to make it work – it’s obviously not great for students and pretty stressful on the staff in the building,” Stoddard told the board. The district spent $625,000 on substitute pay in 2017-18 and $705,000 in 2016-17. The pay rate increase is estimated to add another $40,000 a year to the budget. Last fall, the bus driver shortage was so bad that districts were offering signing bonuses, referral bonuses, free training and guaranteed 35-hour work weeks to attract drivers.